When Dave Felstead started his first job as a shy young lad at Stoke railway station in the 1960s, he couldnt have imagined what lay in store. Those were the final days of steam travel, an outmoded fashion that was never supposed to return. Dave and colleagues used their British Rail priv passes to travel the UK rail network and as far back as 1966 Dave set out on a European rail adventure with a few pals, travelling across Europe to Austria and over the Brenner into northern Italy. Steam did never quite die out and in the age of railway preservation Dave volunteered for the cause of successfully bringing back steam to his beloved Staffordshire Moorlands. Then in 1980 the BBC transmitted THAT programme! Confessions of a Trainspotter was Michael Palins first ever travelogue as part of the Great Railway Journeys of the World series. Dave was transfixed by Palins journey from London to Inverness, then coast to coast across the majestic Highlands to Kyle of Lochalsh, facing out towards the Isle of Skye. That same year Dave was inspired to ride the line himself, then advertising a tour in the local press. 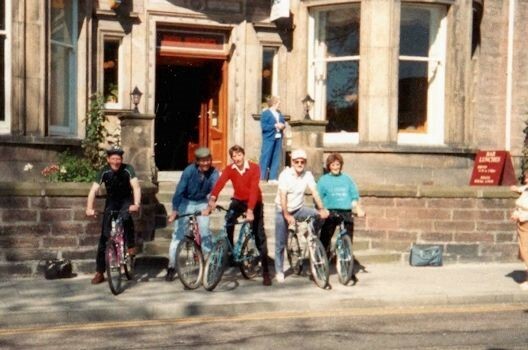 Before long he was escorting a group through Scotland to the Palace Hotel in Inverness and, incredibly, all these years later this very same tour to the very same hotel remains one of Railtrails most popular holidays. For years Dave juggled a day job in the computer labs at Manchester University with his hobby and passion of organising holidays by rail. 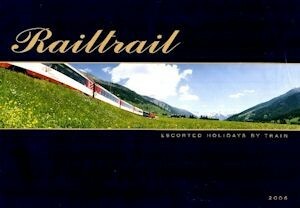 Railtrail was for many years Dave and sidekick Barbara, operating out of a static caravan in Cheddleton in the Moorlands. Since then Railtrail has grown into a small team, moving to our office in St Edward Street in central Leek, with Dave still at the helm and retaining Railtrails original ethos. Put simply, we want to share our passion for rail holidays with you. 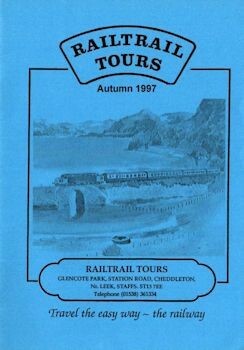 During the 1980s and 90s Railtrail operated successfully a small number of group escorted tours each year to favourite UK destinations, promoting the nostalgia of a golden age when travelling by train on holiday was the norm. 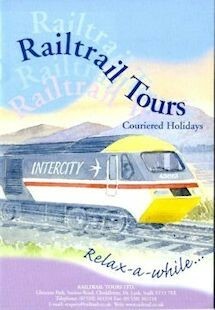 Brochures were hand-made by Dave, but even in those days the holidays uniquely offered the possibility of joining at your local station. To this day our offer of around 2,500 departure stations for our UK tours, with a choice of First or Standard Class, remains one of our unique selling points. The holidays were escorted by a small band of expert Tour Managers and occasionally Dave himself popped in, as illustrated in the below image outside the Palace Hotel in Inverness (Dave is second left). 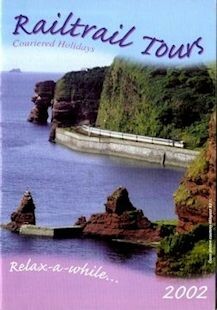 . Daves welcome message harked back to halcyon days of travelling to your holiday destination by train, and the brochures felt like a little work of art, using train and destination paintings of a local watercolour artist. It was around this time that Dave was dragged to Germanys Harz Mountains by a friend to experience the regions timeless narrow-gauge steam railways. Dave was smitten, not only by the steam nostalgia, but by the thick forests punctuated by beautiful half-timbered towns. Not surprisingly, a tour to the Harz featured in the Railtrail brochure shortly afterwards. As with all of our European tours, the journey began at the London Eurostar terminal (then Waterloo, now St Pancras) and we are proud to still send several groups to the Harz, one of our favourite destinations, each year. 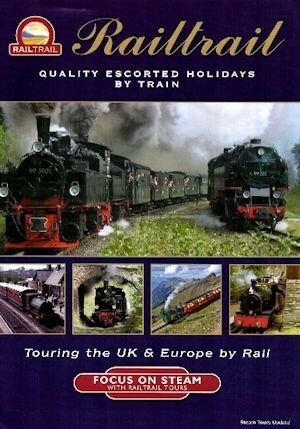 Our 2006 brochure brought with it a new logo, a new office in Leek and an increasing number of European rail holidays. Over the next ten years Railtrails product range continued to grow, including a very strong programme of specialist steam enthusiast tours. For our UK holidays we can offer an inclusive fare in First or Standard Class from any of almost 2,500 departure points  thats every mainland UK railway station! The comfort of train travel is a great advantage, but so too is speed. The Scottish Highlands are two days by coach from some parts of the UK, but are easily reachable by train. Its breakfast at home in Penzance, a light lunch on the train, then dinner with Railtrail in Inverness! Or for our Continental tours, maybe breakfast at London St Pancras, lunch on the train and dinner with Railtrail on the French Riviera or in the Swiss Alps! Many of our holidays feature steam and heritage railway nostalgia during their varied excursion programmes. For steam enthusiasts, however, we go a step further. Each year we produce a programme of special enthusiast holidays, which feature a much greater emphasis on steam travel and heritage, one-off charters and unique experiences, both in the UK and continental Europe. We also offer a programme of Steam, Rail & Ale Trails for travellers wishing to combine the thrills, spills, sights and smells of a day at a steam gala with visits to the best local breweries. Including a taste of the ale, of course; thats another passion of Dave, who is a CAMRA member! And last but not least, in 2016 we offered our first Grand Tour by Rail from Lands End to John OGroats, which has since grown into a successful programme of longer duration, limited-edition, smaller group adventures. Whether you want to touch both ends of mainland Britain on one tour, take a panoramic tour of Scandinavia, follow Michael Palins second Great Railway Journey (broadcast in 1994) from Derry to Kerry or undertake an expansive tour of Europe by EuroCity train, weve got the experience and knowledge to make your holiday a memorable adventure, escorted all the way by one of our carefully-selected Tour Managers. Whether you would like to book one of our Classic UK or Classic European tours, a steam enthusiast special or even one of our bespoke Grand Tours by Rail, hop on the train and let Railtrail take the strain. We would love to organise your next holiday.